Well-being is a term that we use to describe the quality of our life, which includes wealth, environment, physical and mental health, education,leisure time, social belonging, and a sense of purpose in life. When you think about your own well-being, what comes to your mind? Is it happiness, health, money, love, or positive emotions? How do you measure your well-being? Your overall well-being consists of your effectiveness multiplied by your happiness. Effectiveness means that you are able to produce desired results in business, finance, relationships, and other areas of your life. Happiness means that you are satisfied with what you already have in all areas of your life. Being effective does not mean being happy just like being happy does not mean being effective. You can be effective and unhappy, and you can be happy but not effective. Effectiveness is a necessary component of well-being, whereas happiness is a sufficient part of well-being. Physical Health – when this part of your health does not bother you. Psychological Health – when your thoughts and emotions are balanced. Spiritual Health – when you have purpose in your life and know why you wake up in the morning. 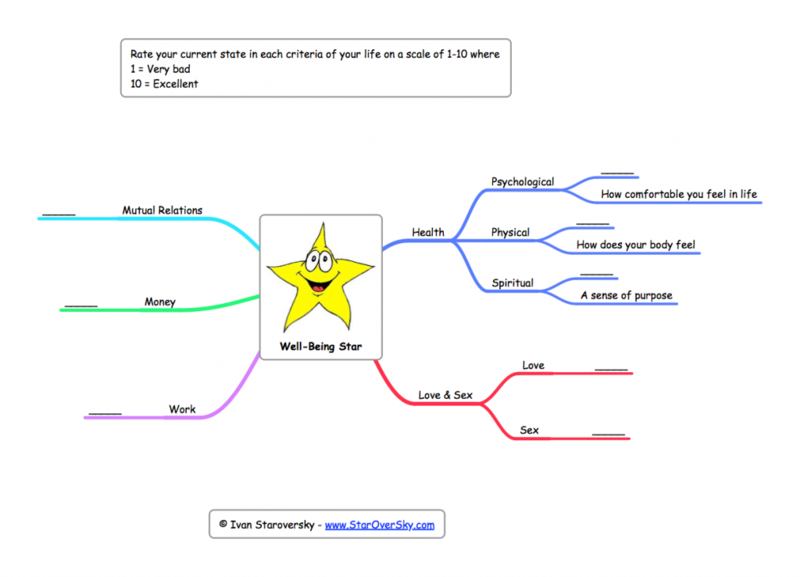 Take a look at The Well-Being Star and rate each part of your life on a scale of 1-10 where 1 = very bad and 10 = excellent. The areas of your life, which scored less than 7 can be improved and areas, which scored less than 5 require immediate attention. The main idea in this model of well-being is to achieve balance in all areas of your life. If you are not successful in any one area of your life this means that overall you are not successful. The Well-Being Star is based on the principle from-inside-out, which means that everything that was created by people in this world, first originated inside the mind in a form of idea, vision, plan, or thoughts, and only then things materialized into existence. Thus, most of what you have and don’t have in life is a reflection of your own thoughts, attitude, beliefs, and behaviors. Everything that you have in your life is a reflection of what you have in your mind, and if something in your life is missing then it is probably missing in your mind to begin with. According to the law of actualization, your thoughts become your reality. If health, wealth, and success are not part of your daily thoughts then they will not become part your reality. Why do the rich get richer and the poor get poorer? Because rich people occupy their mind all day long with how to get richer whereas poor people occupy their mind with how not to get poor. Your well-being consist of mental maps and programs that tell you how to interact with these maps. These mental maps and programs are acquired during your childhood and then fine-tuned during the rest of your life. Mental maps include beliefs about yourself, other people, the world, and God. Mental programs determine how your interact with your mental maps. Relax any way you can. Take your time, listen to your intuitive response, and write down the answers to each section. Once you’ll write down your answers, you’ll be able to see some of the unconscious rules and principles that create your reality. The next step is to change them so that you can improve your overall sense of well-being. Kovalev, S. V. (2011) Neirotransforming: Osnovy samokonsultirovaniya. Moskva: Profit Stajl.